Beyonce posted an elaborately staged picture on her Instagram, showing off Rumi and Sir to the world. There has been fierce speculation about the names of Beyonce and JAY-Z's twins, which were born on June 18. The first hint of what the names might be came out recently when Mr and Mrs Carter registered trademarks for Rumi and Sir Carter. And sure enough, early on Friday morning, these names were confirmed. "Sir Carter and Rumi 1 month today," Beyonce wrote on Instagram. It took just 9 hours to become the second most liked picture in Instagram history. 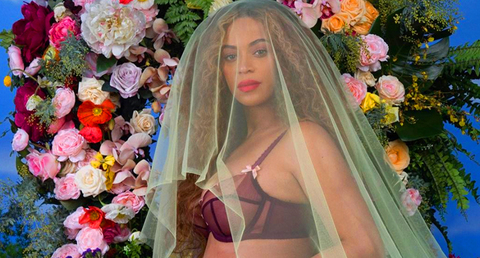 The picture mirrors the one Beyonce posted when she was pregnant, posing in front of a large floral arrangement.